Both sexes: Black, green and white plumage with wispy crest. 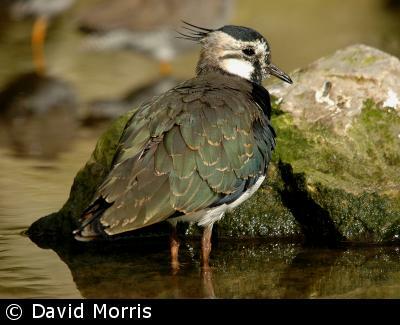 The Lapwing is one of our largest waders, about pigeon-sized, and is also known as the Peewit or Green Plover. From a distance the Lapwing appears black above and white below, but closer observation will reveal the upperparts as a beautiful iridescent dark green and purple. The breast and cheeks are white and under-tail coverts are orange-brown. The legs are pink. The throat is black in the summer and white in winter. Also in the winter, the back feathers have buff edges giving them a scaly appearance. Males and females are similar, except the male's crest is longer and they have blacker breasts and whiter faces. Juveniles have a shorter crest and a very scaly back. They have a slow wing beat that doesn't appear enough to keep them aloft. In the spring, amazing aerobatic displays comprising zigzagging flight, rolls and dives. 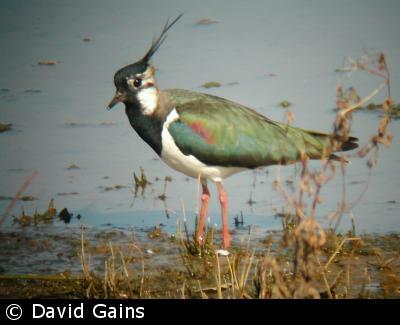 The "pee-wit" call of the Lapwing leads to its alternative name of Peewit. Its song is an enchanting extension of its call: "pee-wit, wit, wit-eeze, wit", and accompanies its relaxed, tumbling aerobatic displays. They feed on invertebrates, such as earthworms, beetles, flies and caterpillars that are on or close to the surface. Starlings often associate themselves with Lapwings. The nest is a shallow hollow, usually in an open area, for example: meadow, marshland, farmland, and industrial sites, indeed, anywhere there is bare ground and damp areas for the chicks to feed. 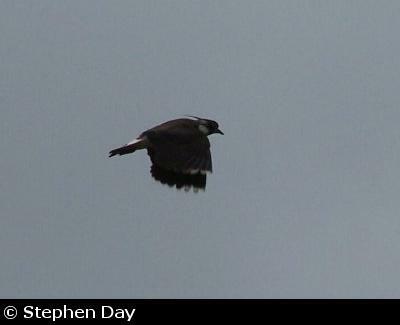 In 2000, I spotted a Lapwing nesting in the central reservation of the M180 motorway. The oval eggs, which are about 47 mm by 33 mm, are smooth and non-glossy, and creamy-buff to stone coloured with black blotches. 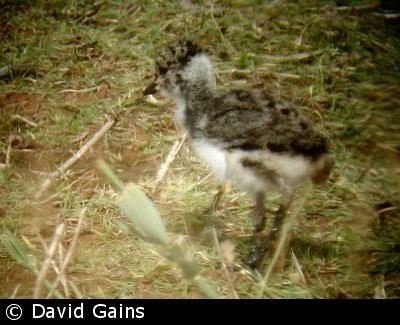 Both parents incubate the eggs. The precocial nestlings are able to feed themselves, but both parents care for them. British Lapwings are mostly resident, but some migrate westwards in to Ireland and others fly south to France and Spain. The winter population is increased to about 2 million birds by migrants from the continent. In the last decade or so the breeding population has fallen by more than 50% and is a cause for great concern (Red List). The decline is largely a result of autumn sowing of crops, which results in crops being too tall for the Lapwings, and a reduction in uncultivated grassland through increased hill farming.